For many domestic workers, work is grueling and exploitative, with long hours and low pay. Some fight back. Others do not, feeling as if the life of a maid or domestic worker will forever mean unfair treatment and meager wages. Some are too afraid that they are replaceable and accept whatever is given to them. Others work because they believe they have no other form of education behind them with which to ask for raises or better treatment. Can domestic workers become empowered enough to fight for better wages and better working conditions, and if so, what are some of the ways they can organize? Indonesia remains a large provider of maids for countries such as a Singapore, Malaysia, Hong Kong and the Middle East, while four million women are also employed within the countries as domestic workers as well. 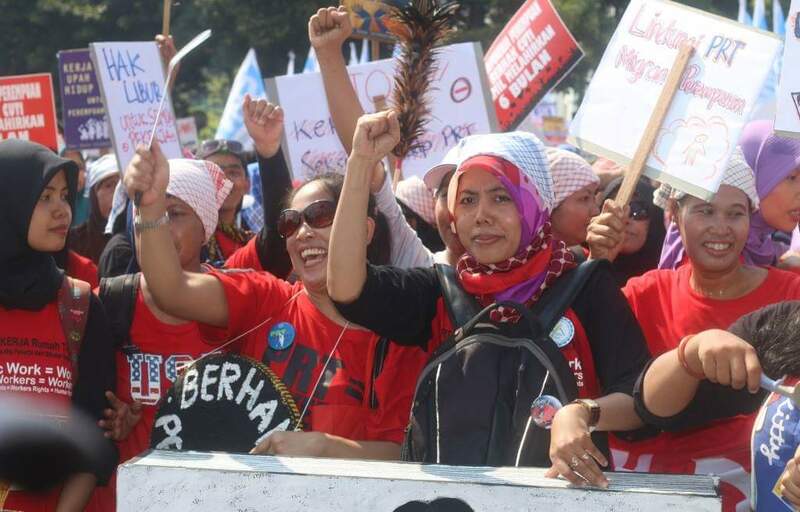 Though domestic work is one of the primary modes of employment for Indonesian women in the country, there is a larger chance for abuse for domestic workers laboring in Indonesia, because, “unlike their counterparts who work overseas, who must go through extensive training regulated by the government, there are no such provisions for local maids.” Thus, local domestic workers are in danger of exploitation and abuse, suffering from long work hours, withheld wages and a lack of formal contract, because the government does not recognize domestic work as formal work with labor protection form formal labor laws. For women like Leni Suryani, the training program instilled the confidence to ask for a higher starting salary. As one of the first graduates of the program, “Suryani said she brushed up her skills on cooking different cuisines, housekeeping and childcare during her training, as well as learning English and using computers. At the end of the 200-hour course last year and after a test, she received a certificate given by a national professional certification board that recognized her skills.” With the certificate, she was empowered enough to negotiate a higher salary with an American family. Training and being given such a certificate instills confidence and pride in work that is done. Like Suryani, it has empowered a once discouraged domestic worker into better wages and a better working situation. Education in workers’ rights and acquiring skill sets to help them improve the prospects empowers all marginalized women to resist falling into the trap of exploitation by means of instilling pride in domestic workers’ earned skill and labor.